What do you do with the crust of the bread? Do you slice off the crust when you make sandwiches? Usually, on normal days, I insist my kids to eat the whole slice of bread because I like to rub it in and tell them, “millions of children are starving and yet you complain the crust is too hard.” But sometimes, when I make sandwiches, I will slice off the sides. You can collect them and make bread crumbs or use them to make meat balls. 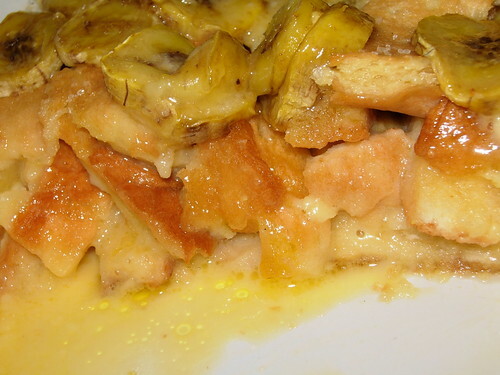 Today, I make a bread and butter pudding with the leftover crust. I added some bananas and it turned out to be so delicious. Grease a baking dish with some butter. Lay one layer of bread crust at the bottom. Slice one banana over the layer. Add another layer of bread crusts. Add a little butter to this layer. 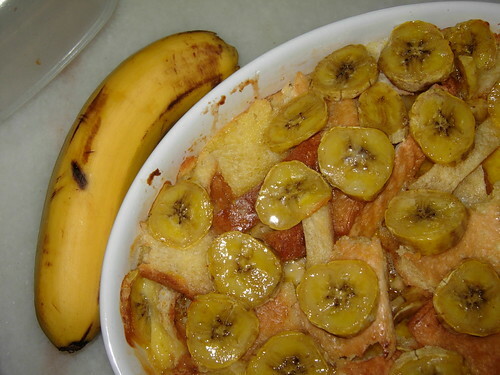 Top with more bananas. It is hard to estimate the amount of bread you need because it depends on your baking dish. Just tear whatever bread you have to fill up the baking dish. Meanwhile, beat two eggs, 3 tablespoons of sugar and 250 mls or about 1 cup of milk until eggs are dissolved. Pour into the baking dish with the bread. Leave to soak for five minutes. The milk/egg should nicely cover the layer of bread. If it appears too dry, add a bit more milk. Bake at 200 deg celcius for 20-30 minutes. 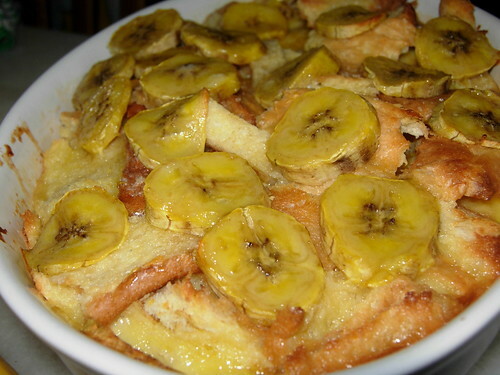 You should get a crispy top portion of the bread, extra sweet and fragrance bananas, creamy and moist bottom layer of pudding.